Even in its most Jerkass Homer-y seasons, The Simpsons has always manages to toss off a joke or two that suggest the writers know language well enough to play around with it. This, after all, is the show that assigned Alexander Graham Bell’s short-lived method of answering the phone, ahoy-hoy, to Mr. Burns, that got the phrase cheese-eating surrender monkeys in the news and that made a certain segment of humanity think that the name for a mythical horse with the head of a rabbit and the body of a rabbit is esquilax. The Simpsons popularized both meh as a term indicating apathy or disinterest and yoink as an interjection to punctuate thievery. And now even people who don’t watch the show would know what you meant if you D’oh-ed. 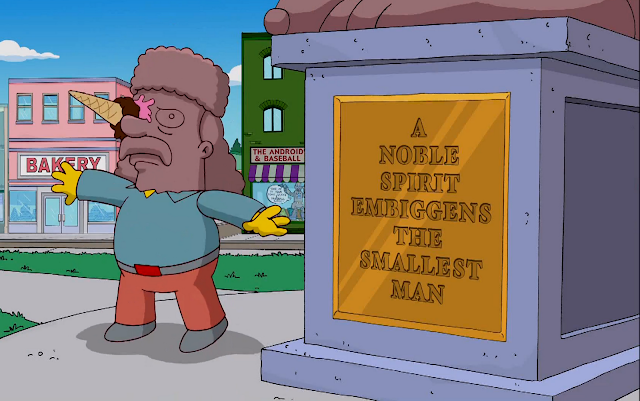 However, if you asked most Simpsons fans what comes to mind first when they think about the show and words, they would probably say embiggen and cromulent — in that order. They are introduced in the same episode, “Lisa the Iconoclast.” Embiggen first appears in the motto of Springfield’s founder, Jebediah Springfield: “A noble spirit embiggens the smallest man.” When Mrs. Krabappel points out that she’d never heard that word before she moved into town, Mrs. Hoover responds, “I don’t know why. It’s a perfectly cromulent word.” Later the same episode features Principal Skinner using both words in the same sentence: “He’s embiggened that role with his cromulent performance.” However, it’s only embiggen that found a notable life outside the show. And while some may have have heard it used since “Lisa the Iconoclast,” few seem to know that the word began before more than a century before The Simpsons hit the airwaves. And that’s why it’s my word of the week. embiggen (em-BIG-en) — verb: to make or become bigger. But the people magnified them, to make great or embiggen, if we may invent an English parallel as ugly. After all, use is nearly everything. So, yeah — he uses this word but then immediately points out what an awkward and unpleasant construction it is. And then it sat, alone and unloved, until The Simpsons used it. And now it belongs to the dorks. And yes, by the way, I think that Australians should have to call something chazwazzahs, even if it’s not bullfrogs. I'm familiar. I actually enjoyed these a great deal. It's too bad round-ups haven't been done for the more recent seasons. And yet, Merriam-Webster doesn't recognize it. What tomfoolery is this?! Because dictionaries only feature words that people would be likely to look up. And the community using this word, while internet-savvy, is just not very big. I wouldn't be surprised if most dictionaries -- the standard Merriam-Webster in particular -- didn't have the majority of my weird, obscure words.